You can’t deny Google is part of our life. We use Google to search, research, compare, navigate, and so many more to make our life easier. Everyone loves Google’s services like Gmail, Google Map, Google Image Search etc. Then, you start hearing about Google AdWords, which makes you wondering “What can Google AdWords do for my business?” The answer is…. a lot! The benefits are MORE than you can imagine. And today I have something that will make you feel amazed by the full features of Google AdWords. Did you know more than 75% of Malaysian consumers shop and buy online now? Now, can your potential customers find you, or your business online? In fact, Malaysia is experiencing exponential e-Commerce growth in the last 2 years. Online transactions grow rapidly via marketplaces, online stores or social media. While big marketplaces players like Lelong.com.my, Lazada.com.my or 11street.my contribute part of these transactions, they do not dominate the whole market. Interestingly, thousands of online stores dominate the online market and the trend is increasing rapidly. Here’s how you can use Google AdWords to boost your online sales effectively. Google AdWords can help you reach the right audience at the right place at the right time. Thanks to the many incredible features of Google AdWords, it can help you generate more leads, sign-ups or boost form conversion. For example, highly competitive industries like insurance need a big number of leads to generate conversion. The more leads they can capture, the bigger chances for bigger market share. Another example is the online marketing industry. When people look for the best online marketing firm, your ads pop out and stand out from the crowd. This is the harsh truth and perhaps the most difficult challenges especially to start-ups. You can have the most beautiful website in the world, the best product and functionality, but if no one views your website, nothing will happen. Increasing website traffic via Google AdWords is the fastest way to let more audience know about your website and business. You might be surprised at the total number of traffic with the help of Google AdWords! Well, these are the top 3 benefits of using Google AdWords. Many people are sill not aware that Google AdWords can also leverage branding and boost repeat customers. So stay tuned for our next post, in which we’re gonna reveal the other crazy benefits you can reap from using Google AdWords! 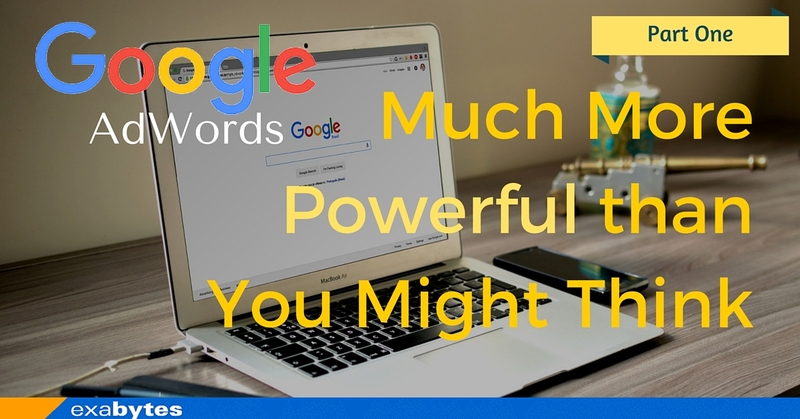 [Updated] Read the Google AdWords – Much More Powerful than You Might Think (Part 2) NOW to master the secret of Google AdWords! Previous articleHappy Labour Day – You Deserve a Day Off!